As I write, following the rhythm of the seasons, amber maple leaves drift through dark fir branches in a forest that is slipping from summer into autumn. Owls swoop silently above the forest floor, in an endless search for sustenance. Voles grub through the duff beneath them, avoiding their watchful eyes. At night, along the lake’s edge, a frog plops into the dark water. Geese honk as they flock up for a southward migration. Stars turn in the night sky, the earth turns, shadows shift angle. God – creator, redeemer and sustainer – loves and tends each along its way of tilt, migration, swirl, orbit, ebb and flow. Or, as we roam or march, crawl or hurdle down unknown paths through wilderness, led only by the light or cloud, or star breaking through from the heavens. Bishops, as all itinerant clergy, MOVE. We miss and mourn what we move from and companions on the way; we read and pray and breathe the shifting view, place, moment; and now we turn to meet and greet, observe and embrace the present; falling short of anticipating the unknown that we move toward. Ah, the deep mystery of a life of faith; the surprising and disrupting pilgrimage of call. God guard and guide us on our way! On this threshold, I have one last task to complete. Culminating six years and more of serious conversation, in June the Yellowstone and Rocky Mountain Conferences both voted by more than 80 percent majority to continue to work and plan for the creation of ONE NEW CONFERENCE where now there are two. In July, the Jurisdictional Conference authorized the creation of one new conference, contingent upon the full discernment and agreement of the two conferences. In conversation, Bishop Oliveto and I agreed that before my assignment to the Mountain Sky Area ends on August 31, I would appoint the new Mission-Shaped Future Guiding Team (MSFGT) to continue this work. I am appointing those named at the end of this Outlook to lead this work. The Guiding Team will be responsible for continuing to lead dreaming and visioning for the project, but they will not be the only ones involved. They will appoint, convene, oversee and coordinate working teams to address specific tasks and challenges. Many more gifted leaders from both conferences will have roles on these working teams. And groups and individuals with particular concerns or perspectives will have opportunities to give input throughout the process. The purpose for this project is MISSIONAL: “To renew and expand Wesleyan Christian Values in its Mission Field in order to empower local churches and laity to achieve the Mission of the United Methodist Church. ... to make disciples of Jesus Christ for the transformation of the world, according to the instructions Jesus gave his disciples.”﻿ * It’s about learning to be like those 70 followers of Jesus in Luke 10, sent to places and people he had not engaged yet, to enter into relationship, to learn their lives, to receive their generosity, and to offer blessings of peace. It’s about asking the missional questions: What is God up to? Who is God animating for ministries of justice, mercy, and forgiveness? How does the Church partner with God in these ministries in new way, through new partnerships? How do we form ourselves, spiritually, for this work? What leaders do we need? How do we organize ONE NEW ANNUAL CONFERENCE to support and empower this new movement of relationship, engagement and experimentation? And, while we are designing a new Conference, how do the existing conferences live together in ways that strengthen ministry and mission NOW, without waiting for two years? 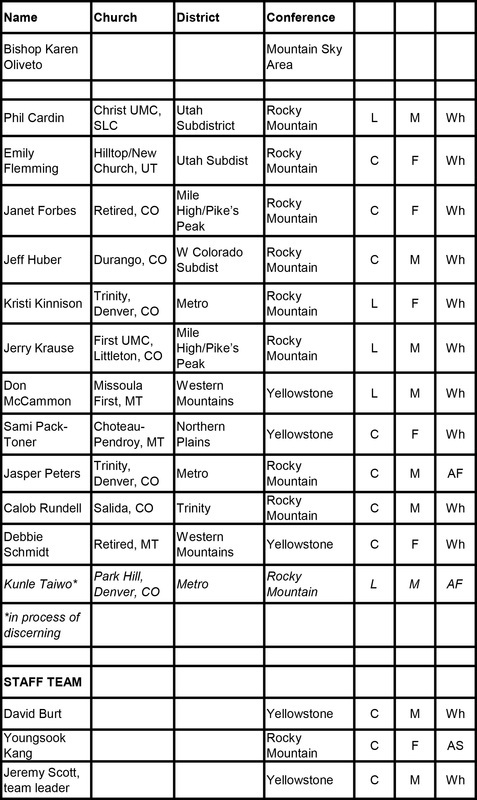 The anticipated timeline will bring some proposals for actions to the 2017 Annual Conference Sessions, with a uniting conference in 2018 to vote on the proposal to create a new conference and legal incorporation to follow in 2019.
for the tenacious Christians who serve Jesus Christ through churches scattered from the “backbone” of the continent, to the great basin in the west and the great plains in the east across prairies, mountains, valleys, deserts, forests. for songs sung, tears shared, prayers lifted, hugs exchanged, miles driven, lives touched, wonder beheld, love exchanged, grace given. You are part of me. I do not leave you behind but carry you ever forward, as my pilgrimage of faith unfolds, and I continue to cultivate the Tree of Life – God’s gift at the beginning, and God’s promise at the end of the Bible, and of our lives of faith. God bless you and Bishop Oliveto as you learn to walk together. God bless you in the way that you take. May it be a good way.